Red Pandas are innocent and cute, right? We took the boys to the zoo last weekend and had SO MUCH FUN. I feel like I had more fun than all of us, even though zoos, in general, creep me out a little bit. I mean, all those animals staring at you from behind those walls? Can you imagine what they’re thinking? How much they want to eat you? Can you imagine just trying to enjoy a leisurely weekend afternoon and having hundreds of people standing around and staring at you? And then I watched the tiger stare at Mike as though Mike was his long lost brother. I mean, I know he’s a cat person, but that was unnerving. Anyway, I had fun watching the fun being had by Mike and Simon mostly. We saw the usual zoo stuff: tigers, lions, and bears (oh my! ), as well as a cool dinosaur exhibit. There were GIANT, animatronic dinosaurs that growled, spit and cool things like that. You’d think Simon would be ALL OVER THAT, right? Well, he was, basically. But later when we asked him what his favorite part was, he told us it was the mister that they used to make you feel like you were back in a swampy time when dinosaurs roamed the earth. Yes, that’s right. I said MISTER. They sprayed us with water and that was all he wanted to talk about when we got home. I could have saved $40 and sprayed him with the garden hose. 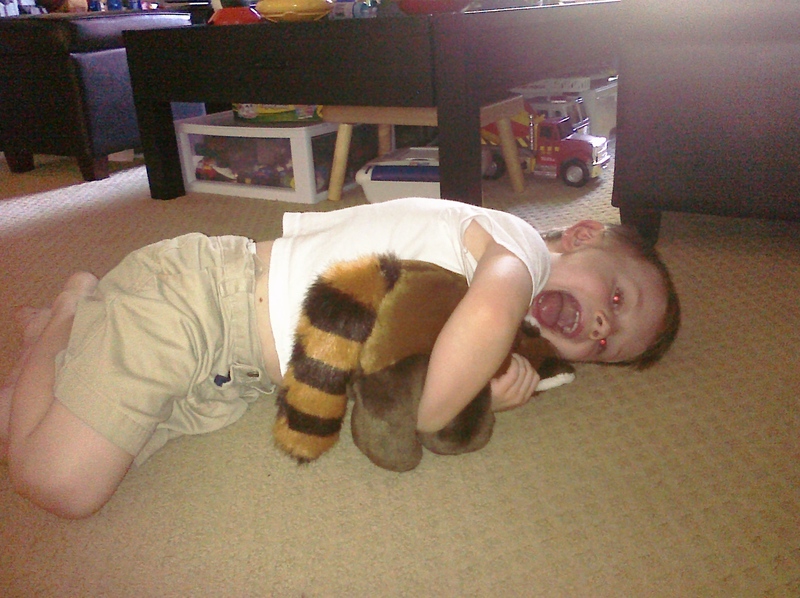 Simon and his Red Panda, which does not have a name, because "it's JUST a stuffed animal, mom." He asked me what sound each of the animals make. I did a pretty good gorilla. He laughed. And then he asked me to make the red panda sound. I know what you’re thinking. And yes, I DID watch the whole thing with him. Repeatedly. And yes, I laughed. Loudly. I even laughed at Simon’s favorite part, where, yup, the panda smacks the crap out of that girl’s face. Please don’t judge me. This is me and my penance for my hypocrisy that I’m sure you’re thinking of while reading this.